One of my secret thoughts as I visit exhibitions is wondering how my work might look up in these spaces. Last year I realised that there were opportunities with the SSA (Society of Scottish Artists) and VAS (Visual Arts Scotland) annual open exhibitions, and as such I got my head down, wrote up my artists statement and notes on my work to be submitted alongside paintings and illustrations for consideration in these amazing contemporary exhibitions. I was fortunate to have two pieces selected for each exhibition water colour pieces for the SSA and Ink illustrations for the VAS. It is a fantastic feeling to see your work on the wall alongside those whom you admire and in such a beautiful space. Really worth all the effort involved, and I also really enjoyed the opportunity to volunteer with the SSA set up. SSA show to the left, my paintings are on the wall alongside work by: Aleksandra Kargul, Helen Glassford, Cecile Simonis, Andrew Phillips, Gillian Murray, Keith Epps, Anupa Gardner and Carol Sinclair. VAS show to the right, my ink pieces are on the wall alongside work by: Annie Mulvey, Aileen Keith and Lyndsey Gilmour. At hand in for the VAS show I discovered that one of my pieces was in the catalogue (-_-) alongside Rebecca Holloway’s Enwrap and Tricia Thom’s Moon Jar. 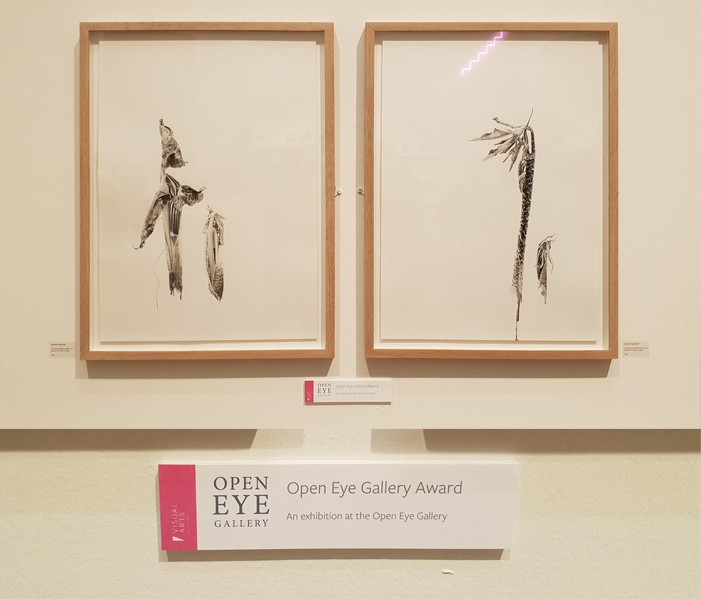 If that wasn’t enough, I was amazed – and I mean slack jawed – to receive an award from the Open Eye Gallery at the VAS ALIGHT 2019 show, the award is an exhibition with the Open Eye Gallery at some point in the future. It’s been a good month for my work! The VAS show is still on as I write, so head along and have a look, there are some beautiful pieces on display! Katherine Tyrrell gave me two really fantastic write ups in her great blog botanical Art and Artists, I really appreciate her support, thanks Katherine!